In some cities and villages, sometimes street lights glow in day time without any reason. In mining regions people face many difficulties due to absence of light in the nights. In frontier and hilly areas, people face many problems due to damaged street lights. For solving these problems, we create a device in which the lights glow in night and in day time, they get switched off automatically and don't glow. Due to use of it, we can solve above problems and can also save electricity. In the project, common emitter n-p-n transistor (BC-547) is used. A carbon resistor has generally four rings or bands A, B, C and D of different colours corresponding to the value of resistance. In project, we use carbon resistance of 1M ohms and 330 ohms. LDR means light dependent resistance which is used to complete the circuit. This is a rectangular prism shape with rounded edges and a polarized snap connector at the top. In project, we use 9-Volt battery. A wire is a single, usually cylindrical, flexible strand or rod of metal. These are used to connect components. A breadboard is a construction base for prototyping of electronics.Because the solderless breadboard does not require soldering, it is reusable. This project is based on Light Dependent Resistance (L.D.R.). LDR is a resistance, in which opposing power of current depends on the presence of quantity of light present, i.e. 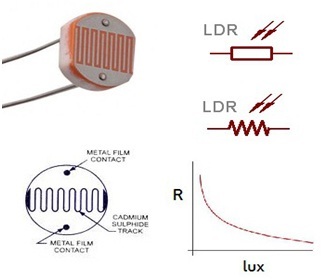 the resistance of LDR increases or decreases, according to quantity of light which falls on it. If LDR places in darkness, the resistance of LDR increases and when light falls on it, the resistance of LDR decreases and act as a conductor. Any LDR in the presence of light and darkness changes its resistance is depending on the different types of LDR. 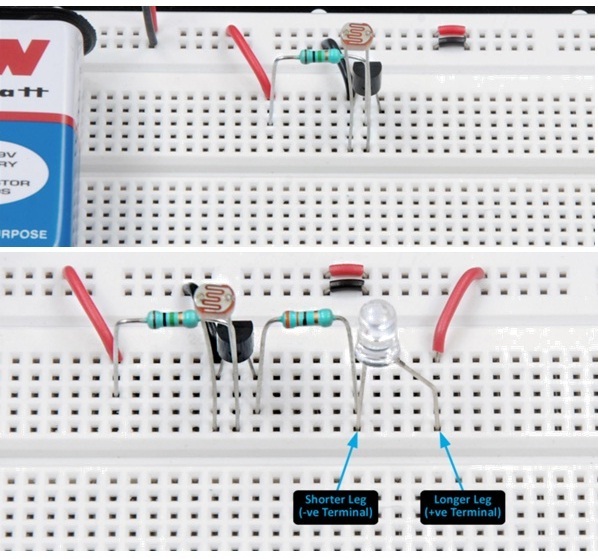 •	Connect a 9V battery on the breadboard. •	Connect an NPN transistor on the breadboard with its three legs (Emitter, Base, Collector) inserted in three different columns of the breadboard. •	The emitter of the transistor is grounded.Connect one leg of a 1 MΩ resistor to the base of the transistor, and its other leg to any different column of the breadboard. Connect the corresponding column to Vcc. •	Connect an LDR between the base and emitter of the transistor. •	Connect one leg of a 330 Ω resistor to the collector of the transistor, and its other leg to any different column of the breadboard. •	Take an LED. Connect its negative terminal to the right leg of 330 Ω resistor, and its positive terminal to Vcc. When the circuit is exposed to light, the led remains off. 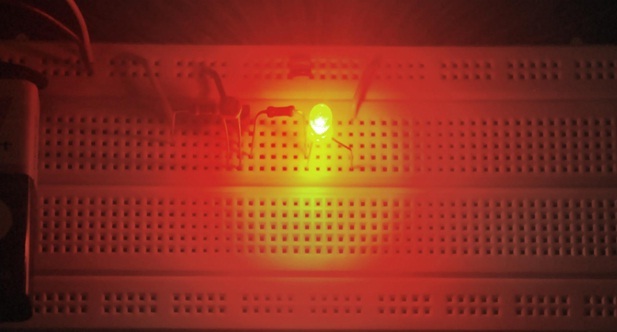 When the circuit is taken into dark, the led glows. •	Excess current should not be passed through LED. •	Make all the connections neat, clean and tight. •	Never exceed the ratings for the current given in the transistor manual.